Markets are continuing to trade lower this morning, though still not quite below last Monday’s opening price. A series of large gains early last week are offsetting end-of-week losses. 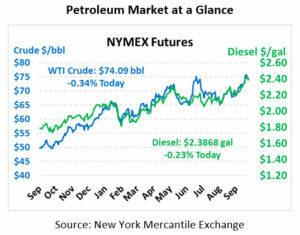 It’s still unusual to call $73/bbl WTI crude a “low” price, but that shows how quickly oil markets can move. WTI crude is currently trading at $74.09, a loss of 25 cents since Friday’s close. Fuel prices are also trading a bit lower this morning, though they show signs of a mid-day rally. Diesel prices are currently trading at $2.3868, down just half a cent after trading as low as $2.36. Gasoline prices are trading at $2.0853, nearly flat to Friday’s closing price. Fuel prices are getting a boost this morning after late-breaking news that the Irving Oil refinery in New Brunswick is dealing with a fire at the complex. Dubbed a “major incident” by the company, the refinery could affect the refinery’s 320 kbpd output, half of which is exported to the US. In international news, Saudi Arabia now claims they have offset Iran’s lost production, countering claims by President Trump that the Saudis are not upholding their end of the bargain. Together with a few other nations, output has increased 1.5 million barrels per day, almost double the Iran export loss of 700 thousand barrels per day. Come November, we’ll see whether that 1.5 MMbpd is enough to offset lost Iranian supplies. 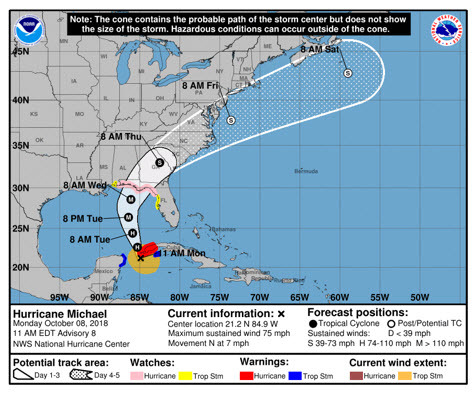 Last week we noted some vague tropical wave threats facing the Gulf Coast – those have materialized now as Hurricane Michael hurdles north through to the Gulf of Mexico. Although the storm was initially expected to be a broad rainy system, the storm has tightened into a hurricane as of this morning, which will likely hit the Florida panhandle. The NOAA is forecasting the storm to strength into a major hurricane (Category 3) before making landfall. Mansfield moved to Code Orange over the weekend in Florida, Georgia, and Alabama. The storm is expected to make landfall either Wednesday evening or Thursday morning. Florida Governor Rick Scott has declared a state of emergency in the panhandle region. 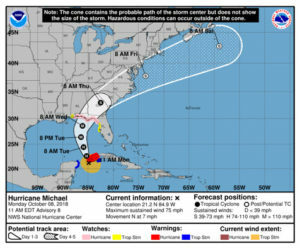 From a national fuel standpoint, although the storm is heading through the Gulf, Michael is not expected to significantly impact refining infrastructure located in Texas and Louisiana. Florida is generally isolated from the rest of the nation’s fueling infrastructure, which will confine the negative fuel impact to the state. However, many offshore crude drilling platforms have been shut down as a precaution, which could cause crude oil prices to move higher, impacting national (and even global) fuel prices.